Over the past century stocks have delivered a 10% annual total return on average. The total return consists of price appreciation and dividend payments. 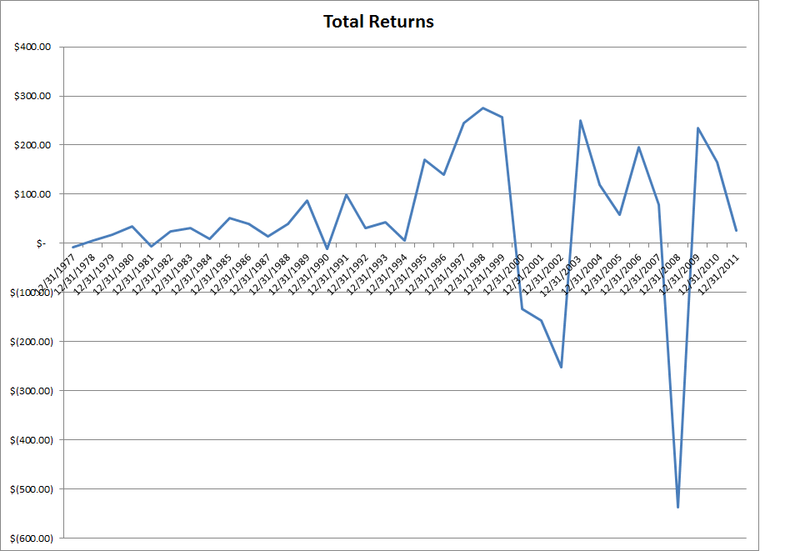 The issue with average returns is that over the past century, there are only a few occasions where stocks clocked in annual returns of somewhere close to 10% in a given year. 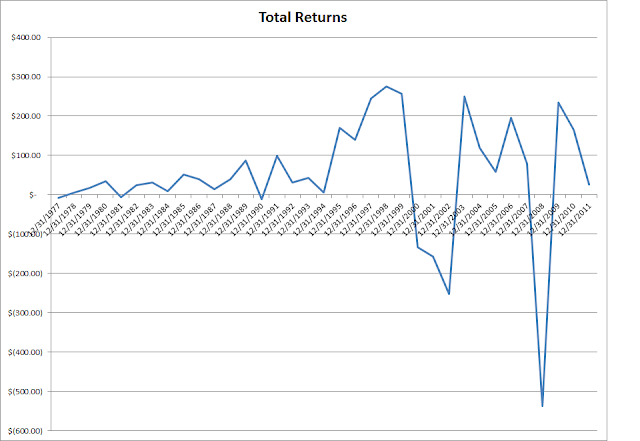 In reality, some years these returns have been much more than 10%, whereas in other years these returns have been less than 10%. As a result, investors should be warned that these 10% in annual returns are not a sure thing every year. A large portion of the volatility in annual total returns comes from volatility in capital gains. Years of prosperity during economic booms are swiftly followed by severe market drops during recessions. Investors who sell stocks to fund their retirement face the risk of selling off stocks at low prices during bear markets, which could result in asset depletion and increases the risk of return to the workforce. As a result, relying on selling off stocks for income in retirement might be similar to cutting off the tree branch you are sitting on. For example, investors who retired in 2000 and relied only on S&P 500 index funds for retirement needs would have less than a few year’s worth of expenses left in their nest eggs by now. On the other hand, dividend income has remained more stable than capital gains. Since 1977, the dividend income for S&P 500 has experienced declines in only 4 out of 34 years. As a result, it is no surprise that the predictable nature of dividend payment amounts is appealing to investors in retirement. Unfortunately, yields on S&P 500 have been low since 1995, and therefore insufficient to live off of. An enterprising dividend investor however can generate a portfolio which has a better current yield, while also enjoying dividend increases along the way. McDonald's (MCD) franchises and operates McDonald's restaurants in the United States, Europe, the Asia/Pacific, the Middle East, Africa, Canada, and Latin America. This dividend champion has raised distributions for 36 years in a row. 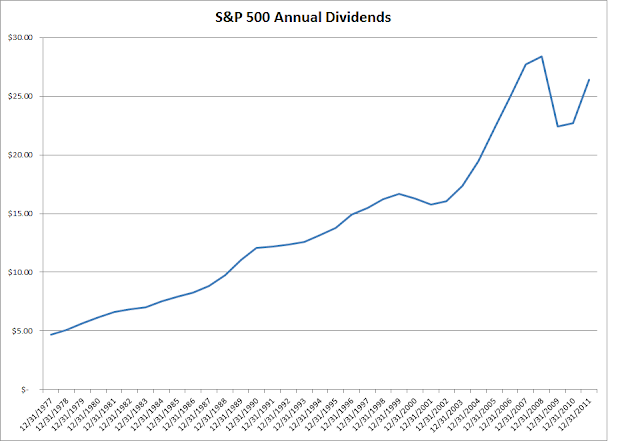 Over the past decade, it has managed to boost dividends by 28.40%/year. Currently, the stock is attractively valued at 18.20 times earnings, yields 3.10%, and has a well covered dividend. 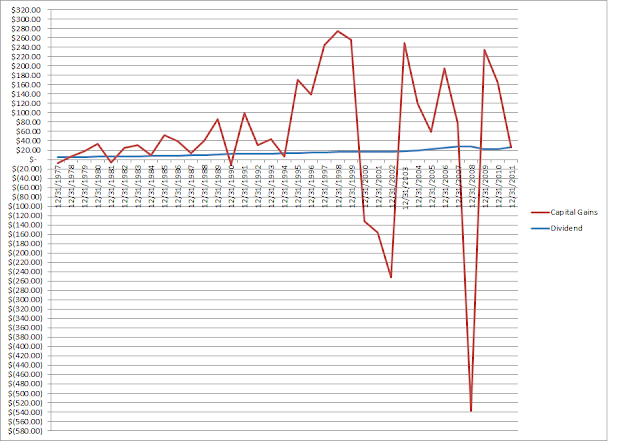 Check my analysis of McDonald's. Wal-Mart Stores (WMT) operates retail stores in various formats worldwide, under three major segments: Walmart U.S., Walmart International, and Sam's Club. This dividend champion has raised distributions for 39 years in a row. Over the past decade, it has managed to boost dividends by 18.10%/year. Currently, the stock is attractively valued at 14.80 times earnings, yields 2.50%, and has a well covered dividend. 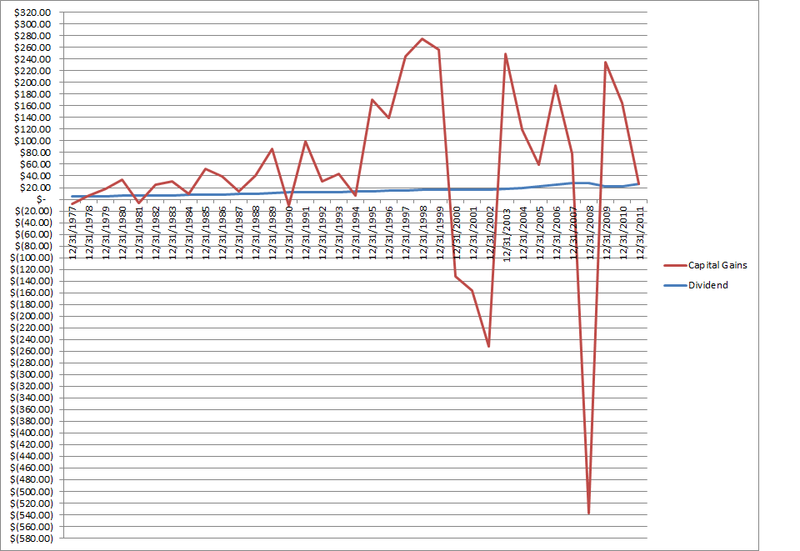 Check my analysis of Wal-Mart Stores. Chevron (CVX) engages in petroleum, chemicals, mining, power generation, and energy operations worldwide. This dividend champion has raised distributions for 26 years in a row. Over the past decade, it has managed to boost dividends by 9.60%/year. Currently, the stock is attractively valued at 9.10 times earnings, yields 3.30%, and has a well covered dividend. Check my analysis of Chevron. Kinder Morgan Partners (KMP) operates as a pipeline transportation and energy storage company in North America. This dividend achiever has raised distributions for 17 years in a row. Over the past decade, Kinder Morgan Partners has managed to boost distributions by 7.50%/year. Currently, the partnership yields 6.20%, and has a well covered distribution. Check my analysis of Kinder Morgan Partners. Realty Income (O) is a publicly traded real estate investment trust.This dividend achiever has raised distributions for 19 years in a row. Over the past decade, it has managed to boost dividends by 4.20%/year. Currently, the trust yields 4.80%, and has a well covered dividend. I would consider adding to the stock on yields above 5%. Check my analysis of Realty Income.